Unfortunately, I don’t have a solution for how you can get out of it completely (other than hiring someone to follow you around and take the receipts from the cashier for you), but Expensify.com can really help take the pain out of the process. 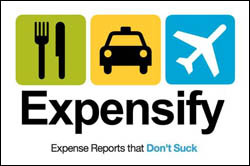 I’ve been using Expensify for almost a year now for my Life In Student Ministry, LLC, business expenses and love it! Basically, I use their smart phone app to snap a picture of my receipt each time I purchase anything with my business account. It uploads the image to my Expensify account and optionally scans the image to automatically plug it into an expense report for me. Whenever I need to, I can just login to the site and print out the report, hassle free. No need to hold on to receipts anymore! Most of my business purchases are made online, though, so instead of using my phone to take a picture of the email receipt on my computer screen, I just forward the email to receipts@expensify.com and, again, it’ll parse the receipt for an expense report and/or just hang on to it for when I need it later. If your church’s treasurer is up for it, they could even connect their Expensify account with yours to snag your expense reports and receipts for the month and even submit reimbursement online directly to your personal bank account through the site (available for 15 states so far). You can also use Expensify to track milage, scan business cards to add to your contacts, and more. The best part is that Expensify.com is free except for $0.20 to optionally scan a receipt (invite friends to the service via email to get free credits) or $5/month if you need more than 3 users on your account. I’ve been using it for a year, though, completely for free without needing to pay for anything. QUESTION: Do you use Expensify? How well does it work in taking the hassle out of expense reports for your ministry?